The Harmony Sweepstakes A Cappella Festival, the premier American showcase for vocal harmony music, celebrates its 16th year in 2000. The annual national competition draws from hundreds of vocal groups from around the country with regional competitions in eight cities. The winning group from each festival is flown to perform in front of celebrity judges and a sold out house of enthusiastic a cappella fans at the National Finals. Current Champions of the Far Western District, barbershop quartet Freestyle are known for not only their great singing but also their zany antics, characterized as "a few fries short of a Happy Meal." Recently named Entertainment Champions at the prestigious Buckeye Invitational, their memorable show is sure to please, and members of the group have appeared on countless stages and milk cartons throughout the land. Tenor Todd Kidder recently gave up his dream of being the first 5 ft. 9 in. center of the NBA, while bass Bruce Morgan is the (Volvo) owner of a (Volvo) dealership in (Volvo) Santa Rosa, but does not use this venue (Volvo) for his own personal (Volvo) gain. Baritone Andy Wallace is an unassuming financial mastermind, collecting paperclips in his spare time. Lead Rich Brunner is the best-looking member of the quartet and his mother really loves him. It¹s Freestyle entertainment tonight! DILEMMA: Take the power of rock, the grit of blues, and the smooth groove of R&B. Add commanding vocal percussion, an impressive bass line, a compelling vocal and stylistic range and you have the 5-woman group -- DILEMMA! Based in the San Francisco Bay Area, Dilemma was founded in November 1998 by a group of women who wanted to challenge the traditional female a cappella sound. The result is dynamic and powerful music encompassing a range of original compositions and covers. Audiences are continually impressed with solid harmonies, captivating melodies, engaging stage presence, and an infectious beat. Dilemma has entertained at corporate events to great acclaim and repeatedly dazzles local cafe and club audiences. With voices that command attention and performances that resonate, Dilemma is winning an instant fan base and breaking down the boundaries of female a cappella. The Eclectics, who hail from the Sacramento area, were originally formed in 1997 (as Rogue Mercenary Christmas Carolers for hire). Since, they have expanded their musical styles, encompassing doo-wop, R&B, Motown, and contemporary POP. Their arrangements of classic hits include tight backrounds and vocal percussion. For most of its history, the Eclectics have been a quartet but with the recent addition of a fifth vocalist, they have become the 'World's Largest Quartet',weighing in at just over 1,000 lbs! Freestyle: Current Champions of the Far Western District, barbershop quartet Freestyle are known for not only their great singing but also their zany antics, characterized as "a few fries short of a Happy Meal." Recently named Entertainment Champions at the prestigious Buckeye Invitational, their memorable show is sure to please, and members of the group have appeared on countless stages and milk cartons throughout the land. Tenor Todd Kidder recently gave up his dream of being the first 5 ft. 9 in. center of the NBA, while bass Bruce Morgan is the (Volvo) owner of a (Volvo) dealership in (Volvo) Santa Rosa, but does not use this venue (Volvo) for his own personal (Volvo) gain. Baritone Andy Wallace is an unassuming financial mastermind, collecting paperclips in his spare time. Lead Rich Brunner is the best-looking member of the quartet and his mother really loves him. It¹s Freestyle entertainment tonight! Kai is a pop vocal quintet from the San Francisco Bay Area. Kai is also an abbreviated form of the Tagalog word kaibigan which denotes the common bond among all people. The quintet chose a Tagalog moniker because four of its five members are Filipino-Americans. In addition to the Rhythm Crossover chart hit, "Say You'll Stay," Kai (Geffen Records) features a variety of harmony-drenched gems, ranging from silky ballads to funky, mid-tempo workouts, to shimmeriing, gospel-tingled spirit lifters. Formed in 1992 Kai has experienced every aspect of the music business. Since its inception Kai has traveled the world, appeared on numerous compilations and has released an album under Geffen records. Kai's lastest album, "The Promise," is receiving major attention in various markets and features a new and exciting arrangment of The House Jacks' standard, "Gone." Kai was produced by Tristan Bishop, a founding member of the rock/funk a cappella group The House Jacks. The Kinsey Sicks are renowned throughout their own minds as America's Favorite Dragapella Beautyshop Quartet, and are beloved by Popes and taxidermists everywhere. Having assualted the sensibilities of tens of thousands of audience members at performances in the San Francisco Bay Area, the divas have increasingly been forced to tour the U.S. to find fresh victims. The gals first performed together as contestants in the Miss Teen-Pregnant America pageant, where they shared the Miss Congeniality award. After a brief stint as Menudo, they quickly compiled an impressive list of film and television credits, including fluffer duties for Regis Philbin and as chalk outline models for "America's Most Wanted." Thanks to the magic of sexual favors and strategically hidden video cameras, the Kinsey Sicks have received praise from critics across the country, and have won numerous music awards. They have performed for such luminaries as Slobodan Milosovic and Charo in esteemed concert halls and highway rest stops across the country. speedzoo If they were a building, they'd be Fallingwater. If they were a sensation, they'd be vertigo. If they were a game, they'd be Quidditch. If they were a flower, they'd be a trillium. If they were weather, they'd be the light after the storm. If they were land, they'd be Atlantis. If they were food, they'd be a warm chocolate torte with wild raspberries and creme fraiche. [Mmmmm... chocolate]. But they're not. Lisa, RJ, Damon, Ken, and Joel are a health educator, custom publisher, two engineers, and a linguist, and together they're speedzoo. Combining experience in collegiate a cappella, rock bands and touring theater, these singers set out in 2000 with the simple purpose of making music they love. From passionate to whimsical, familiar to hyperbolic, fantastic to sophisticated, their enthusiasm and eccentricity recently earned them the diagnosis "obsessive creativity disorder." See for yourself, and to hear more, visit www.speedzoo.com. Have a listen to their mp3's and sign up for their email list. There. We said it without using the words "tapestry" or "cornucopia," isn't that great? THREE 5 AND 6 These five guys were born for this, though they only found each other a few months ago. From day one, passion was written on their songs and emblazoned on their hearts. Call it dance -- call it groove -- call it Motown with a blissful funk. However you choose to describe it, their music is hot and they're doin' it right. As a group, "Three 5 and 6" has only been in existence since October 2000 but it's members have individually performed professionally for years throughout the United States and Europe. Collectively, they have performed on over 30 nationally and internationally released albums covering styles ranging from gospel and jazz to rap and hip-hop. These guys are big...big on the groove that will make you move. So hold on to your seat and absorb the beat! Can you feel it? Total Chaos: When the efforts of finding a name integrated into a void of "Total Chaos," it was then this quartet was born. These four gentlemen from Santa Rosa and Kenwood have spent the past two years dazzling audiences all over the state providing an eclectic, harmonic experience of Barbershop, Doo Wop, and Contemporary A Cappella music. Bringing the gift of music to eager listeners, Dave, Willis, Paul, and Ben have extended the influence of A Cappella to festivals, benefits, private parties and high schools, as well as other youth outreach programs, in order to attract future performers and appreciators to the A Cappella world. 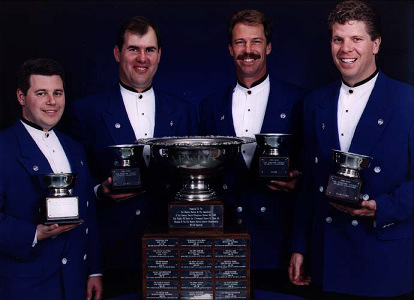 After their start in 1999, TC were crowned the Far Western District High School Barbershop Quartet Champs, and later were ranked seventeenth in the world after competing in the MBNA International Collegiate Competition in Kansas City, Missouri, sponsored by SPEBSQSA. From day one, these two high school seniors and two sophomores from Santa Rosa Junior College have been singing songs, making harmony, and meeting many beautiful girls who thankfully appreciate what they do. So take a seat and hold on tight, and you will experience Chaos tonight! Gary Bolles: A much sought after coach and clinician within the SPEBSQSA, Gary has been singing, teaching and conducting Barbershop Harmony throughout the United States and abroad for nearly 40 years. He has been a certified contest judge since 1975 and has judged the Society's International Contest seven (soon to be eight) times. As a performer, Gary has sung baritone in several District Champion quartets and has twice made the semi-finals in his eleven appearances in International Quartet competitions. He is currently the Musical Director of the Pot O' Gold Chorus, three-time Far Western District Champion and five-time International competitor. Gary holds a Bachelor of Music Education degree from Boston University. He taught vocal music at the junior high school level for ten years and often works with young singers in Bay Area schools. Andrew Chaikin made his name as a singer, songwriter and producer with vocal-band pioneers The House Jacks, and is considered one of the world's foremost vocal percussionists. His beats have funkified albums by the Bobs, the Nylons, and the Persuasions, and caused Chronicle columnist Jon Carroll to devote an entire column to Andrew's "Lips of pure gold.". As a singer and voice-over talent, he can be heard on many national TV and radio commercials, Web sites, and video games. These days he performs live with fellow ex-Jack Austin Willacy, the industrial percussion ensemble Rhythm Slam, and the techno-tribal collective Mixtape From Mars. Tammy Heinsohn is the Santa Cruz a cappella maven. She has been a fan of a cappella and harmony music since she was born. She currently sings a cappella music with the Santa Cruz Shape Note Society, and she loves introducing people to the joy of the human voice raised in harmony. Tammy has served as an Ambassador to the Contemporary A Cappella Society since 1993. She is a founding director for SCATS, Santa Cruz Acappellafest and Talent Showcase, which produces the annual Santa Cruz Acappellafest in March each year. She has conducted workshops at the A cappella Summits and at ACAFEST, the Acappella Company's contemporary Christian music seminar. To support her a cappella habit she works as a computer analyst for the University of California Santa Cruz. Laura Moody ---after graduating from college with a degree in voice, Laura came out west from Illinois in search of some more interesting geography. A lifetime lover of radio, Laura found herself behind the microphone at radio station KALX 90.7 FM in Berkeley where she can still be found spinning her favorite records as alter ego Laura in the Livingroom Monday mornings from 6-9 AM. There is nothing stronger than the power of the human voice, and she continues to explore vocal genres that push through mainstream musical boundaries. She may sometimes be found at The Alley or at The Mint belting out her infamous version of Goldfinger.